THERE ARE NO SURPRISES HERE FOR THOSE OF US WHO SAW IT COMING – THE REST OF YOU DESERVE IT!!! 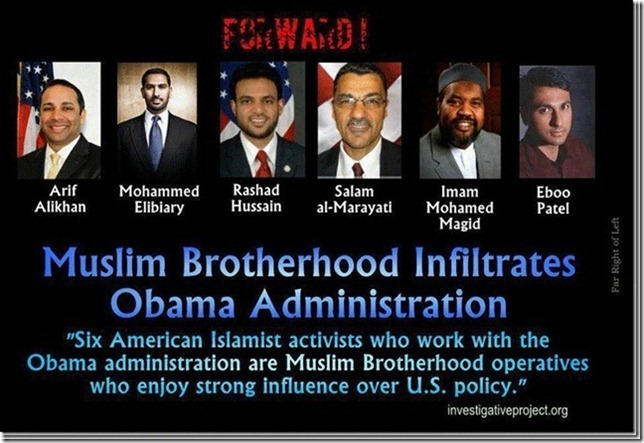 Six American Islamist activists who work with the Obama administration are Muslim Brotherhood operatives who enjoy strong influence over U.S. policy. This is flat out scary!!!! Now ask me why I am concerned!!! That’s one out of six……you don’t have any comments about the others? Well, Rashad Hussain “was born in Wyoming and was raised in Plano, Texas, the son of Indian-born U.S. citizens. His father, Mohammad Hussain, was an eminent mining engineer. His mother Ruqaiya, and his older sister Lubna are medical doctors, and his younger brother, Saad is a medical student.” “He holds a Masters degree in Arabic & Islamic Studies from Harvard University, and a J.D. from Yale Law School. At Yale, he served as an editor of the Yale Law Journal.” Certainly sounds like a radical left wing family to me, Right? Bobby Jindal: “Piyush Jindal was born in Baton Rouge, Louisiana, to Amar and Raj Jindal, immigrants from Punjab, India, who came to the U.S. six months before he was born.” ” He applied to and was accepted by both Harvard Medical School and Yale Law School, but studied at New College, Oxford, as a Rhodes Scholar.” I guess, Bobby has a similar back ground to Rashad, Right? So they are both ‘Muslin Brotherhood folks”, Right? Oh, I guess not since Bobby is a Catholic, but how do you know that is really what he is? Maybe Bobby is a plant in the RW and will destroy it in the future. You do know that these innuendos of “Muslin Brotherhood” are tiresome at best and at worst are lies. Ah. Thank you for the clarification. Who was President in 2005. Yes I’m going to make you look it up, it’s called research.